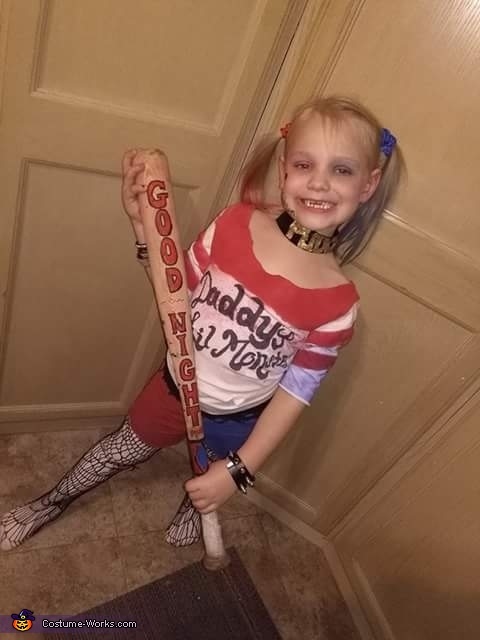 6yr old nariah dressed up to be Harley Quinn from suicide squad. Everything except bracelets, belt, and fishnet tights we made. The top started as a White long sleeve shirt. I cut arms to length and cut neck area. Then taped off and sprayed with fabric paint, red then blue. I freehand with black sharpy for the logo and then we cut the holes. The bottoms were cut from yoga pants then sprayed with same fabric paint as the top, red then blue. Gold puffy paint was used on a piece of black velvet for the puddin choker. The bar was sanded then using red and black sharpys wrote goodnight blue paint market for the diamond, as for the poem I didn't find it appropriate so I wrote repeatedly the word black with black sharpy red with a red and blue with a blue. Black liquid eyeliner was used to draw face tattoos, (heart shape and Rotten) blue and red colored hair spray covered pigtails.